Flag Points 45 Part 1 features an epic Knock It Off segment featuring American Defense’s SIT. Flag Points episode 44 is up, and it’s all about catalogs. 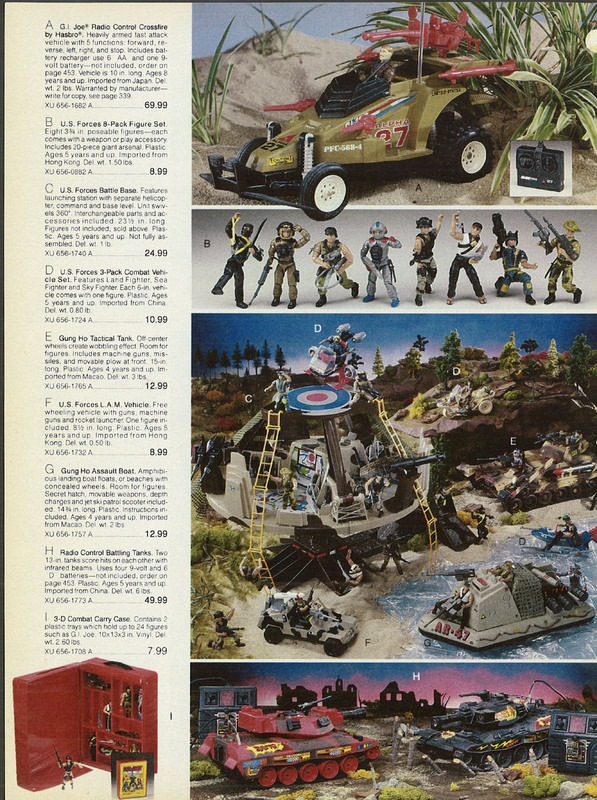 My Knock It Off segment features the page below, featuring US Forces, from the 1987 JC Penney catalog. 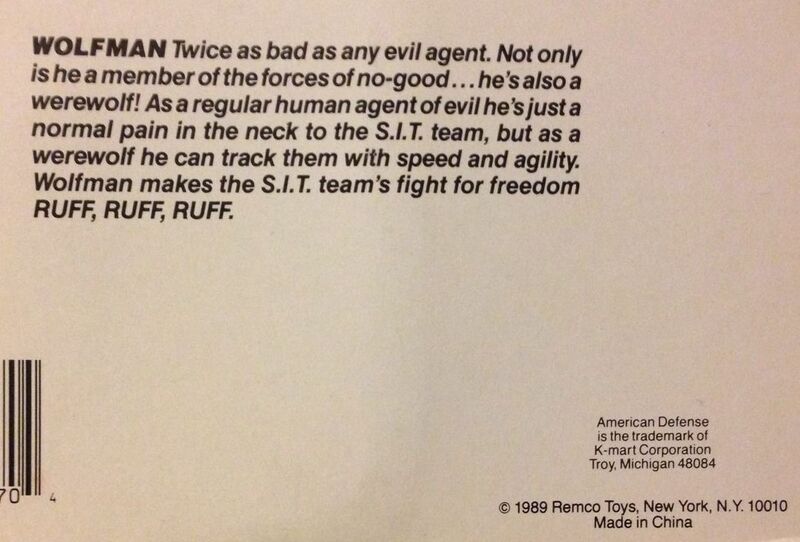 Flag Points Episode 43 is live, and in the Knock It Off/Off The Base segment, I cover Lanard’s K-9 Corps, the wackiest dog/human hybrid action figure line ever. While you listen, check out the pics below, including the impressive red werewolf with chainsaw that I spotted at last year’s Lanard sale. Amazing. Flag Points episode 42 is up, and in the Knock It Off segment, I cover the Magnificent Team. Do some of these guys look familiar? Flag Points episode 34 is up, and with it a new Knock It Off! segment. This time we have the very French European Force. Take a look at the pic while you listen. to the segment. It’s like a Read-Along book! 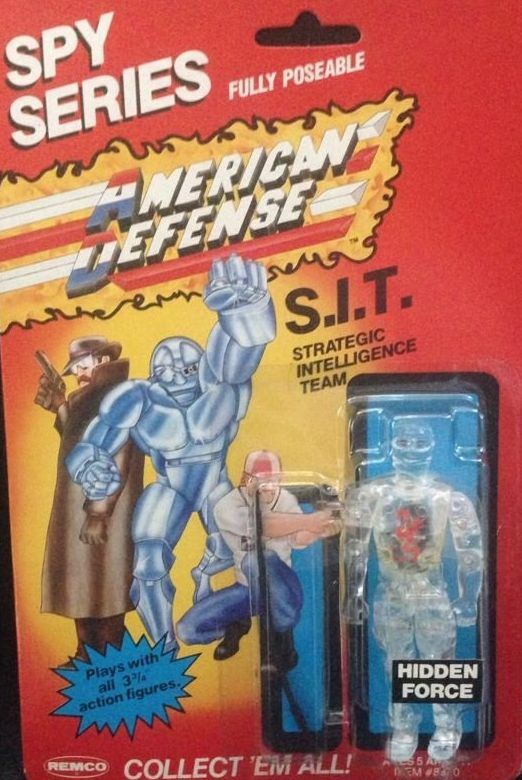 European Force is the code name for Europe’s daring, highly trained bootleg force. It’s purpose: to defend human freedom against MYGAL, a ruthless, terrorist organization determined to rule the knock-off world! Mon dieu! I’ve recently started a new segment on Flag Points. 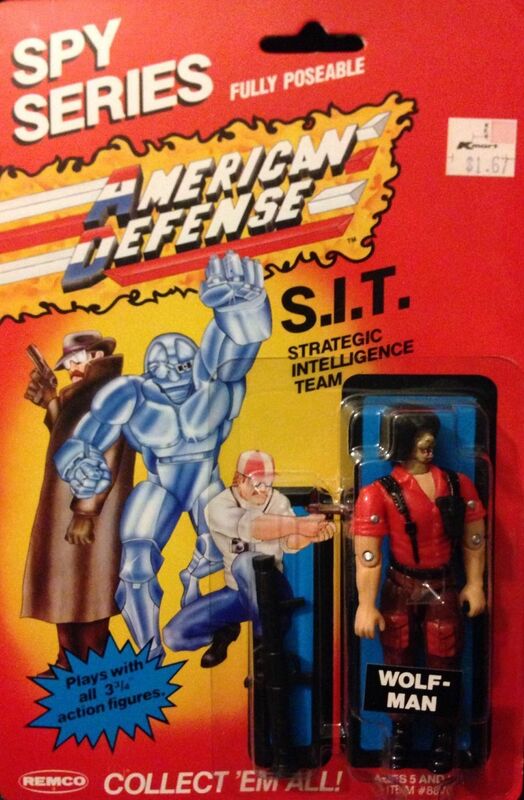 It’s Knock It Off, in which I cover one of the myriad GI Joe knock-offs. The debut segment in episode 33 features Power Commandos, by world renowned toymaker Lucky Bell. Here are a few pics to use as visual aids while you listen to the show. It’s like being there with us in the top Secret Flag Points recording studio. Take a listen! Creature 1: Who are these guys? Creature 2: You know, they’re Those Guys from the Other Galaxy. Creature 1: Oh, that’s right. I forgot. I’d really love to meet the person who wrote the file cards. Couldn’t have been a day over 12.
anonymous was me, oops. sorry. gotta sign in i guess. I was living in Ecuador when I came across the Power Commandos. 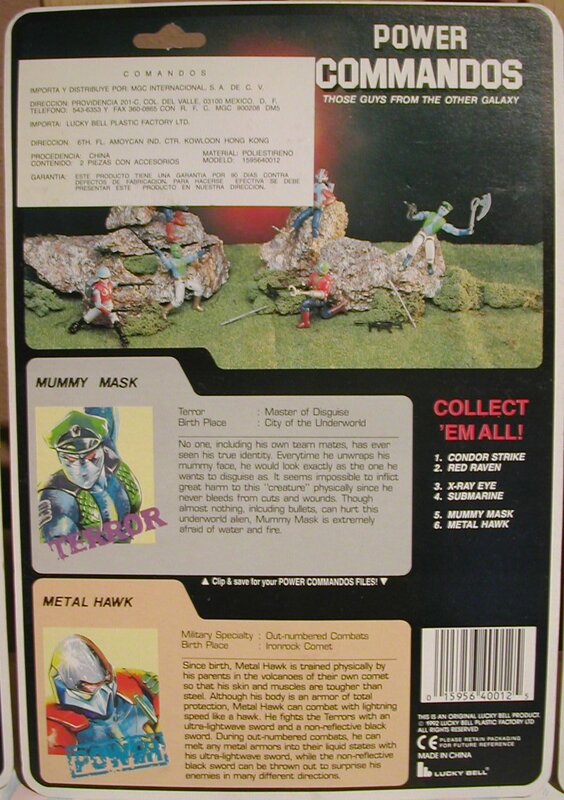 Mummy Mask was so out there I didn’t pick it up at the time- he was a blue mummy dressed like the biker dude from Village People- what is up with THAT? I got a different set of 2- the blue and green ranger who was wearing a baseball cap and a red helmet bomber dude. I sold them years ago online, but now I wish I’d kept them. 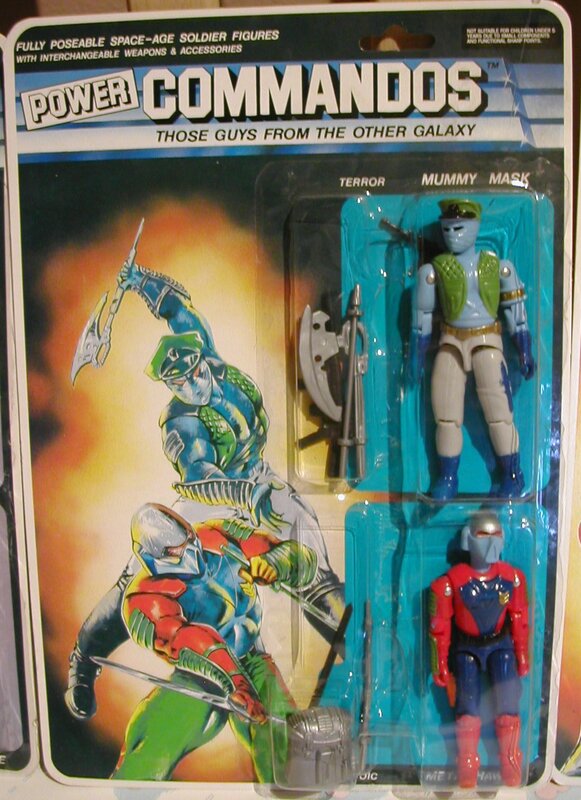 That was part of the magic of what you could find in South America at the time… I also found all of the Lunartix aliens and star Brigade figures down there. The Magnificent Team really outdid themselves. Not only did they get Hawk, Shipwreck, Beach Head, Dial-Tone, and Low-Light to defect but they also seemingly recruited Hammer from The Corps! My son would love those K9 figures! The jeep was from originally from Remco’s SGT. ROCK, there were good and BAD GUYS version. The S.I.T. was one of the most inspired concepts within the American Defense line. 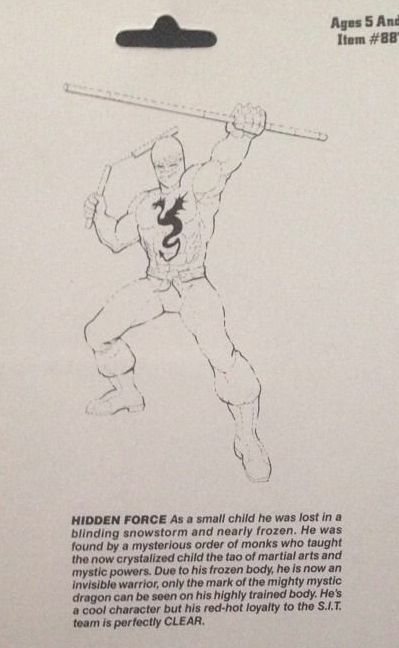 You gotta admit that Hidden Force is kinda awesome for what could have turned out to be yet another ninja/martial arts rip-off character. His origin is so out there that it actually works for the figure. I wish I’d gotten these guys back when they warmed the pegs at my local K-Mart. Keep up the great work on the knock off figures. They need more exposure like this!